As Seattle Mayor Jenny Durkan rolls out her plan to make community college free, a new national report by a think tank says such plans have the greatest success when their message is simple. 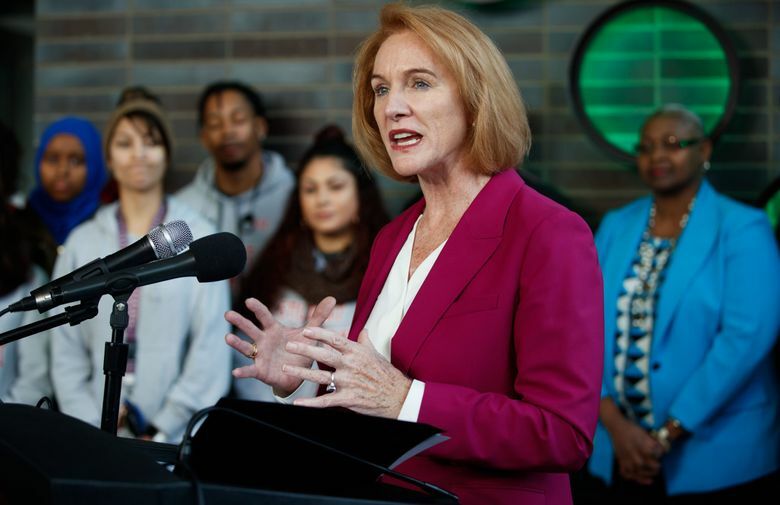 One of Seattle Mayor Jenny Durkan’s top goals is to make community college free for every Seattle high-school graduate, and last week, she rolled out a program that would do so over several years. The plan, which would likely work in concert with College Bound and other state and federal aid programs, would pay for two years of community college for every Seattle public high-school graduate. It will not have an income or GPA cutoff, nor does it require students to sign up years in advance or exclude students who have gotten into legal trouble. Her proposal coincides with a new report by a progressive think tank, The Century Foundation, that examines the success of so-called “promise” programs — which guarantee to pay tuition for graduates of a state’s high school — and details those elements that lead to a high success rate. Author Jennifer Mishory, a Century Foundation senior fellow, says simple plans tend to work best. Plans that have fewer restrictions tend to attract more students. “The clearer the message, the easier it is to understand for students who might not otherwise enroll,” she said. Mishory already counts Washington as one of the 16 “promise” states, although the program is far from simple. Washington’s College Bound program pays college tuition and fees for students who are low-income, sign up by eighth grade, maintain at least a C average and don’t get into legal trouble. It’s good for both two- and four-year colleges. Durkan’s plan represents the expansion of an idea first launched in 2008. Called the 13th Year, it began as a partnership between Cleveland High School and South Seattle College and guaranteed every graduate a year at the college tuition free. It was funded by private donations. It later expanded to include Chief Sealth and Rainier Beach, and in 2017 to include West Seattle, Garfield and Ingraham, with partnerships at all three community-college campuses — North, Central and South — that make up Seattle Colleges. The 13th Year students get special aid to improve their chances of completing college. For example, they’re offered a class on how college works. Mishory said support services like that are important extras that can make a promise plan more successful. Under Durkan’s plan, starting this fall, graduating students at those six Seattle high schools (Cleveland, Sealth, Rainier Beach, West Seattle, Garfield and Ingraham) would get two full years of college tuition, enough to finish an associate degree. Students already in the program, who took their 13th year in 2017-18, will be eligible to receive free tuition for a 14th year, as well. Students would generally be assigned to go to the community college closest to their high school — for example, Garfield students would go to Seattle Central College. In 2019-20, seniors from all of the Seattle School District’s high schools would be eligible to attend any Seattle College. Durkan’s proposal notes that even though community-college tuition rates are low — about $4,000 a year — many middle-income families have to take out loans to pay for college. Washington’s financial-aid program for low-income students, the State Need Grant, is considered one of the most generous aid programs in the country, but financial-aid experts say it doesn’t do anything for families that are in the low-middle of the income spectrum. Durkan’s proposal would also be open to all students regardless of citizenship status. That’s true as well for the State Need Grant. And this session, the Legislature passed a bill expanding College Bound to include students who have Deferred Action for Childhood Arrival (DACA) status, known as dreamers. Durkan’s office estimates the expansion will cost $1.7 million in 2018-19, and will serve about 1,000 high-school and college students, including outreach and college preparation services. About 215 students will receive 13th-year scholarships, and an estimated 120 students will be eligible to receive 14th-year scholarships. The money will come from the city’s general fund, the sweetened-beverage tax and the Seattle Colleges. As more students take advantage of the program, the costs will increase — to $4.4 million in 2019-20, $5.7 million in 2020-21 and $6.3 million in 2021-22.